WaterDoodle is magical. 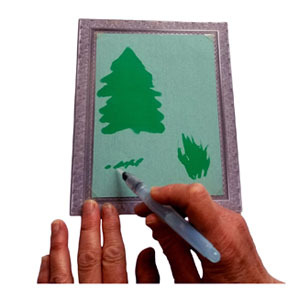 It's a fantastic, creative art activity that allows people with dementia and Alzheimer's to doodle away with no mess or fuss using our special DoodleBrush and WaterDoodle paper. Start with one of the doodle art pages, the "Palm" drawing or a blank slate. The choice is theirs. 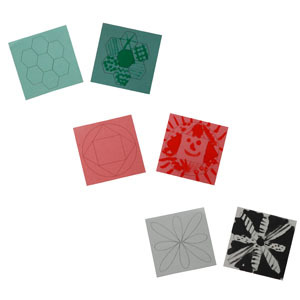 The WaterDoodle Grab & Go package includes three WaterDoodle sheets that are pre-printed with a pattern that gives the person a starting point for their doodling creativity. 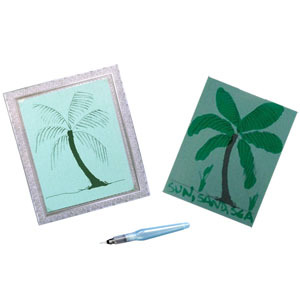 Also included is a "Palm" image that can be "painted" and enhanced, as well as a blank WaterDoodle sheet for the truly creative. There are also completed samples provided to help give some ideas of what can be done. Choose your favorite! WaterDoodle makes it easy for almost anyone to engage in creative doodling and experience the benefits. Use the Doodle Starters to get the creative juices flowing. The person can color in the pattern, use dots, stripes boxes, whatever comes to mind. If they're stuck, use the included finished templates for ideas. There is no right or wrong, no good or bad. The idea is just to be creative and have fun. For a less abstract activity, use the palm image as the starting point. The person can color the image and add their own embellishments such as words, grass, birds. If the person is hesitant, they can use the included finished template for ideas. Anything goes with the blank "slate"! It's more challenging than using the doodle starters or the Palm picture, but it offers a fantastic outlet for creativity.Draw a picture, create doodle art - anything goes. With WaterDoodle, you don't have to be an art therapist to help someone with dementia or Alzheimer's be creative. Don't just uncover the art, create it!